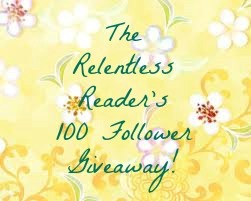 The Relentless Reader: 100 Follower Giveaway! I've recently reached 100 Followers on GFC and I'm all giddy excited about it! With that in mind let's celebrate with a little giveaway shall we? Yay! Good luck! Thanks Colletta :) I get excited every time I hit a new number too. I know that not all of those people are reading every word I put out there but still ;) It's just a nice measurement. Yeah! I'm in. I remember how giddy 100 is too. Congrats! I'm stalking you now! Just kidding! BTW you have a beautiful blog! That's great! I love my stalkers! :) Thanks so much Kendal! Congratulations on your first 100! Thanks Brian :) It's a nice milestone for me, yay! Thanks so much Ara, and thanks for entering! Thank you so much for your wonderfully supportive comment on my "For the Love of Books" post on my nonfiction blog, MINDSPIRIT BOOK JOURNEYS!! I really appreciate it!! If you really like this blog, please consider becomeing a follower. Hope you do! Congratulations! It took me three years to get to that point! Thanks Michelle! Same to you :) You're a reader after my own heart! Congrats on the Follower mark! I have officially signed up since you said I'd be a fool not to come over and enter a giveaway ;) I totally blanked out it was BBAW & I normally join in, and it sucked missing out on the BBAW Fanfare. Thanks! I'm a fan of subscribing my email too, it's just easier for me :) I appreciate that you do so! Congrats Jennifer - I have to check how I followed you but I definitely did GFC tonight which I prefer, the emails get lost and overwhelming to me. I think I found you at work and the GFC doesn't show up, its blocked or something, that may have been the problem. Here is to many more Cheers. Thanks Aleksandra, and you're welcome :) Good luck! So happy for you...I told you this blog would be a hit and it is!!! Loving it! Dawn! Hello my sweet friend :) Thank you so much!